Take 2 liters of milk and curdle to make Chenna (If required please see the video on "How to make Paneer"). Take a slotted plate (Chillula pallem in Telugu) and spread a muslin cloth in it. 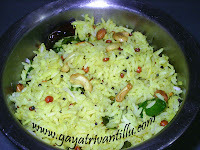 Pour this Chenna along with water into this slotted plate. After all the water gets drained, gather the muslin cloth together and press to remove excess water from Chenna. To test whether all the water has got drained or not, take a little Chenna in your palm and rub with your finger until it is smooth. Then try to make a ball from the rubbed Chenna. If you get a firm ball then you are ready to make Rasagullas. If the ball is too smooth and falls flat then it means that there is still some more water present in Chenna which needs to be removed. There is another method to remove water. Take a slotted plate (Chillula pallem in Telugu) and spread a muslin cloth in it. Pour this Chenna along with water into this slotted plate. After all the water gets drained, gather the muslin cloth together and Put some heavy weight (preferably the grinding stone) above this which will press the Chenna in the muslin cloth. Due to pressing excess water gets drained out. Here I kept the Chenna under heavy weight for one hour. When all the water is drained we get a flat, dry Chenna mixture which we call it as Paneer. Divide this Chenna into 2 parts. Here I got 270gms of Paneer and I have divided it into 2 parts weighing 120gms and 150gms. Knead the Chenna by hand. Take the Chenna on to a clean platform and start rubbing it with your palm. Gather the Chenna together and rub once again. Repeat rubbing till the Chenna is smooth. We should feel the ghee on our palm (even when you use low fat milk to make the Chenna, you would feel the ghee on your fingers). We should get smooth dough to get soft Rasagullas. It takes just few minutes of rubbing patiently. Take a pressure cooker and add some water to generate steam for cooking. Now put this pressure cooker on heat. Take 1 cup sugar and 3 cups water in a flat dish on another stove and heat it. Stir the sugar mixture till all the sugar is melted. Now allow this syrup to boil. Meanwhile make 10 equal portions of the smooth Paneer dough. Now make these portions into round balls by rolling them between your palms. When the sugar syrup is boiling add the Paneer balls to it slowly. Now transfer this bowl from the stove into the pressure cooker and close the lid. When the cooker is about to whistle, simmer the heat and cook for 15 minutes before switching off the stove. When the cooker cools down completely, remove the pan from it. Now you can see that your Rasagullas are double in size and look like sponge balls floating in water. Keep them aside for at least 4 hours before you eat so that they become firm by absorbing more syrup. In the second way knead the Chenna by using a food processor. Take a processor bowl and select the flour kneading blade to process. Scramble the 150gms Paneer with fingers and add it to the bowl. Now close the lid and run the processor on low speed. Initially you will see that the Paneer is dry. After sometime you get soft dough from the scrambled Paneer. Then stop the processor and check. Keep them in refrigerator (not deep freezer) till use. 1. Take a sufficiently wide dish to steam cook your Rasagullas. If it is a narrow dish they get attached to each other like Siamese Twins (in this case Siamese Tens). 2. If you are not successful in the first attempt don't worry. Nothing goes waste in this dish. Gather the Paneer, squeeze out the syrup and enjoy it with the family or put it in Navratan Kurma. 4.The entire art of Rasagulla making depends on how much to knead paneer into a soft dough. Kneading should be optimum. Not more not less and it comes by experience. In three to four attempts you should be able to make good Rasagullas and feed a Bengali Dada to put him to surprise!!! 5. My Bengali friend says that if a girl can make good Rasagullas she makes a Good HOME!!! I watched your video on how to make Rasgullas. The manner in which you have described and shown is very interesting. Thank you so much for this! However, I had a clarification regarding the steaming of rasgullas. When you say “When the cooker is about to whistle, simmer the heat and cook for 15 minutes before switching off the stove” – do you mean I have wait for the cooker to let the steam and then add the weight(like the way we cook rice)? Any information would be very helpful since this is the 2nd time I made them and failed miserably L. This time around, I would like to follow your procedure and hopefully be successful.. I am talking assuming you also have a cooker like the ones we have in India. Put the rasagulla bowl into the cooker, close the lid along with the weight. Allow it to build steam fully but do not allow it to whistle, simmer the stove at this level, and cook for fifteen minutes, increase the stove and let it build the steam fully but not to allow it to whistle - at this level switch off the stove and allow it to cool completely. Do not pull open the weight, or put the cooker under tap. Allow the steam to escape normally and then open the lid. When the cooker is cool, remove the bowl and keep the rasagullas aside for minimum 4 hours so that they absorb syrup and become firm for good to eat.Thereafter, if you can put it in the fridge for 1-2 hrs they taste great!! 1.when we have old gasket on the cooker, which doesn't retain the steam. Hope these tips would help you to make good rasagullas everyday as I do. hello gayatri ji,i firftly want to appreciate you for the g8 job u are doing. ive learnt how 2 cook rasagullas frm your site.my doubt is for how many days can we eat those rasagullas whch are prepared in that method? cn v increase tht duration by freezing them? and also plz tell me what mistake during the preparation makes them taste sour and wat are the precautions to be taken to avoid it? It would be nice if my viewers indicate their names in the post so as to enable me to address them. After 4 to 5 hours of preparation Rasagullas should be kept in fridge. Else they would turn sour. Fridge stored rasagullas may be taken for 2-3 days. In fact rasagullas which are slightly cold taste much much better than the warm and fresh ones. The latter would be spongy and give a rubber feeling while eating. Frozen Rasagullas are not good to taste. I've made rasgullas following ur instructions. They turned out well to look at but they didn't absorb sufficient sugar syrup and they are not porus as shown in your video. Anyways that was nice preparing them. Thanks for the recipie. Try to knead the paneer till smooth. The fat in the paneer should ooze to grease your hands. That process should help you to achieve better results. Thanks for a quick reply. Paneer oozed out the fat as u said may be the next time i'll get better results. Can you please clarify if we have to count the cooking time of 15 minutes AFTER GETTING THE FIRST WHISTLE or 15 minutes FROM THE TIME WE PUT THE WEIGHT OF THE COOKER …..as my rasagullas came out hard!! What I mean is "15 minutes FROM THE TIME WE PUT THE WEIGHT OF THE COOKER …". As regards your rasagulla coming out hard, kindly check the following. If the milk is reconstituted either in the factory or at home, the rasagullas would be hard. I use packet milk supplied by the dairy. Therefore sometimes even I get hard rasagullas. If the steam gasket on the cooker is weak and leaking also the rasagullas do not get adequately soft. Ensure that the vessel is wide and not overcrowded with rasagullas with less syrup. I make rasagullas almost every week in "Hawkins" pressure cooker. I trust the above information would help you to make good rasagullas. Thanks for your prompt response within half an hour of my post re Rasagollas! But please allow me to “nag” you a little more and pardon the verbosity! 1) In the first session, the initial cold water in the cooker would take considerably longer to reach boiling point and emanate steam…..say 6 minutes, before you ACTUALLY put the weight…so 6+15 minutes suggested by you=21 cooking minutes. 2) In the second session, the water at the base of the cooker is already considerably hot so you are likely to get steam-out say within 2 minutes. So if you put the weight on the second minute then 2+15 minutes=17 minutes becomes the ACM. ( in other words there is a cooking-minutes time variation of 19% between the first and the second session) and so on …the ACM gets PROGRESSIVELY LESSER with each successive “vayee”….So if the ACM is not a consistent factor, then one would perhaps not get consistent results!. Put both pressure cooker (with water) and the bowl for the syrup simultaneously on the stoves and light the fire in both the stoves. Thereafter proceed with your preparations. “ HO-HO NAAKEY MUNTHU ….”!! I started to make rasagulla after watching your video. Thrice I failed ... but they tasted awesome.. this time as I was waiting for the milk to shrink. I kept it in sunlight.. later heated it so the cream was brewing. I removed the cream and tried to make it. But the balls were of same size and they turned hard. What may be the problem??? Hi, I just tried your recipe for rasgulla and it turned out awesome! Thank you sooo much!! nenu mee site chudatama ide first time.chala bagundi mee idea.maa laanti bachlers ki baaga use avthundi mee vantakalu.prathidi baaga chupincharu.thxs for ur recipes. nenu meeru chupinchina vidam gane rasgulla chesukunamu baaga vachay.thnk u.
mee vantillu naku baga nachhindi.mee reciepees kuda chala use avutayi nalanti vallaku. nenu rasagulla receipee chusi , chesanu.maa husband ki baga nachhindi. naku set dosa receipee kavali.meeru add cheyagalara ee site lo. WE HAVE TRIED YOUR RECIPES IT IS VERY USEFUL AND TASTEFUL TO EAT. RASAGULLA IS HIGHLIGHT BECAUSE WE USE TO PREPARE THIS RECIPE FOR PAST 2 YEARS BUT WE CAN'T ABLE TO BRING THE CHENNA IN GOOD MANNER. NOW IT WAS CLEARD TO MAKE IT AND WE DONE IT HATS OFF MADAM. BUT I HAVE SOME DOUBT IN MAKING RASAGULLA THAT IS WE CAN USE ANY OTHER MILK RELATED PRODUCT TO BRING RASAGULLA. IT REDUCE US THE COST PRICE . (THAT IS FOR COMMERCIAL PURPOSE). KINDLY TELL US THE NEED FULL THING FOR US. THANKYOU.